Parking spaces so narrow you need to be a contortionist to get out of your car, crowded bays where every millimeter counts, terrifyingly tight boundaries marked with countless traces of scraped metal and paint residue from combat at close quarters: this is where the new Porsche Cayenne can slip in with particular elegance. It’s all made possible by Remote Park Assist, a convenience feature chock-full of high tech. 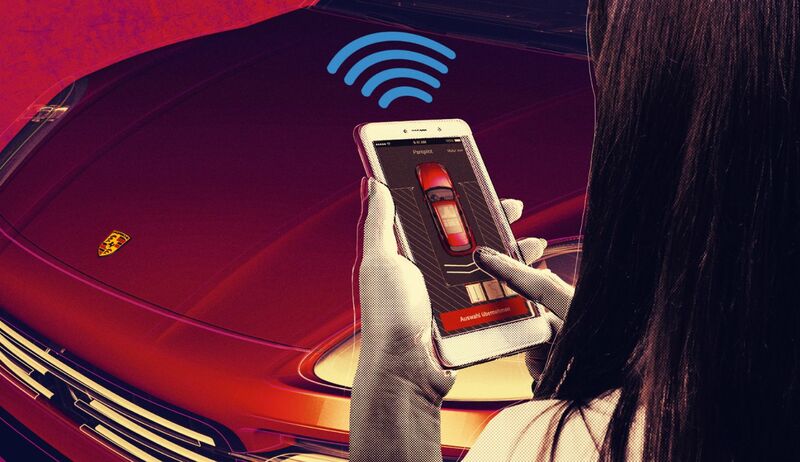 Remote Park Assist is based on smart assistance systems like parking spot search, a feature that detects and highlights suitable parking spots when driving past. All the driver has to do is stop and activate Remote Park Assist. Whether the parking space is located on the left or right side of the street, whether it’s a parallel parking spot or at a right angle, and whether for the latter the car needs to park forward or in reverse—it’s all achieved with a simple tap of your finger, as the system can be easily controlled using a smartphone. The driver presses and holds the OK button in the app until the vehicle has finished parking automatically. The car can even negotiate its way around narrow garages. The clever thing here is that the driver doesn’t even need to be behind the wheel. He can get out beforehand and just watch the car park itself. Sensors and surround-view cameras provide the data needed for perfect parking and pulling out. That may sound simple, but the system is complex: four high-tech processors in the central driver assistance control unit (CDAC) coordinate twenty additional control units. These evaluate data from twelve ultrasonic sensors in real time. Remote Park Assist with Surround View uses four individual cameras to compute a 360-degree view that helps with parking and maneuvering. The car moves within this digitalized cocoon—with an optimal level of caution, precision, and safety. If Remote Park Assist detects a pedestrian, a high curb, or a bollard near the vehicle, the system interrupts parking or makes an automatic adjustment. Naturally, the parking process can be paused by remote control at any time.